After multiple designs for a residential building at The Portals complex were rejected by the Commission of Fine Arts, a shorter, boxier version has been given the thumbs up. Now at 13 stories, the number of units at 1331 Maryland Avenue has been reduced from 440 to 365 units. Per the Washington Business Journal, there will be 290 apartments and 75 condos on the top four floors. 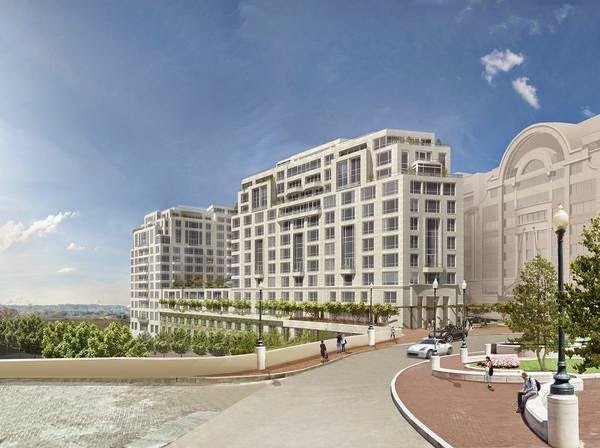 Due to its location at the end of Maryland Avenue, units will have views of the Jefferson Memorial, the Tidal Basin, the Potomac River, and the Capitol. Republic Properties expects to start construction on the project in about a year. 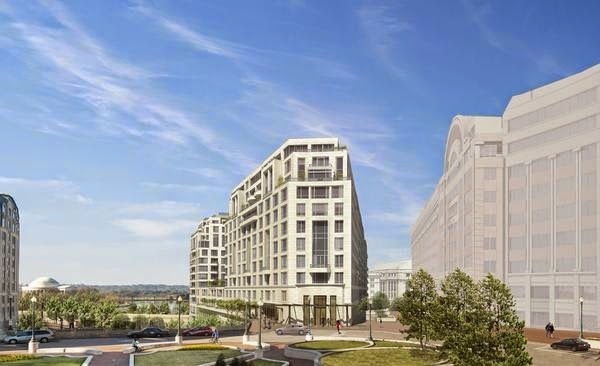 1331 Maryland Avenue will be the first residential project built south of the National Mall and north of the SW freeway since urban renewal. Currently, the Portals complex has three office buildings and the Mandarin Oriental Hotel, along with ground floor retail. The newest retailer is Flippin’ Pizza, which will soon open on the ground floor of the Portals I office building at 1250 – 1280 Maryland Avenue. The restaurant will seat up to 51 patrons and its Class DR liquor license was approved last month by ABRA, which allows the sale of beer and wine. Aside from the planned residential building, a fourth office building (Portals IV) is planned on the remaining vacant parcel between 1331 Maryland Avenue and the Mandarin.